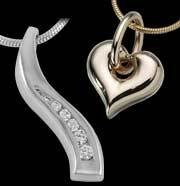 This beautiful and wide range collection of stainless steel keepsake jewelry is suitable for anyone. These unique pendants hold a nominal amount of cremated remains and allow you to always keep your loved ones close. They come with a satin cord and a jewelry gift box. To personalize your stainless steel pendant, you can choose to have it engraved or accentuate it with a stainless steel chain. All orders are placed with the funeral home and we can add the cremains to the jewelry for you.